40 mm Vickers1 х 1 pcs. Storozhevoi — Soviet Tier II destroyer. 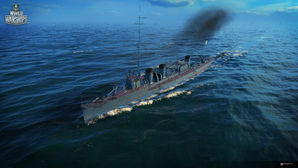 Tier II's Storozhevoi marks the beginning of the Russian destroyer branch and introduces the basic gameplay elements of the line. Storozhevoi plays best when opponents are kept at arm's length and while her guns to do consistent damage; her speed and range should allow her to do so easily. Although she can launch 9 torpedoes at a time and reload them rather quickly, captains should not rely on them and are advised to forget about them in most cases. They should be used only if an unsuspecting battleship presents an opportunity — for example, wandering too close to an island, allowing for a close approach and subsequent torpedo attack — or an enemy destroyer wanders too close. Other than such chance encounters, the 4.0 km range of Storozhevoi’s torpedoes is suicidally close. Great reload time on torpedoes; armed with more torpedo tubes than any other Tier II destroyer. Excellent gun range for Tier II, especially for a destroyer. Good ballistics and rate of fire. Good speed, faster than Derzki. AA defense is superior to Derzki, but useless with no carriers at Tiers II and III. Abysmal torpedo range speed and damage. Storozhevoi is actually the name of a Deyatelnyy-class torpedo boat (Деятельный), later reclassified as a destroyer in 1907. It was built in 1905 and stricken in November 1925. As such, it is extremely unlikely the in-game version would have carried the same name as another destroyer that was in active service. Storozhevoi uses the same 450 mm Goncharov Triple torpedo tubes as Izyaslav and Svietlana, yet she cannot mount Model 1912 torpedoes. The actual Model 1908 torpedoes have a 2.0 km range and 27 knots speed.